9% CAP RATE ON CURRENT INCOME! The Chestnut St Portfolio is a tremendous opportunity for a cash flow minded investor to secure 6 rental units in surging Murray Hill. Portfolio consists of (6)units in (5)buildings on (4)contiguous lots. 100% rented with a waiting list from Agency sources. Each property has been fully renovated with many upgrades. 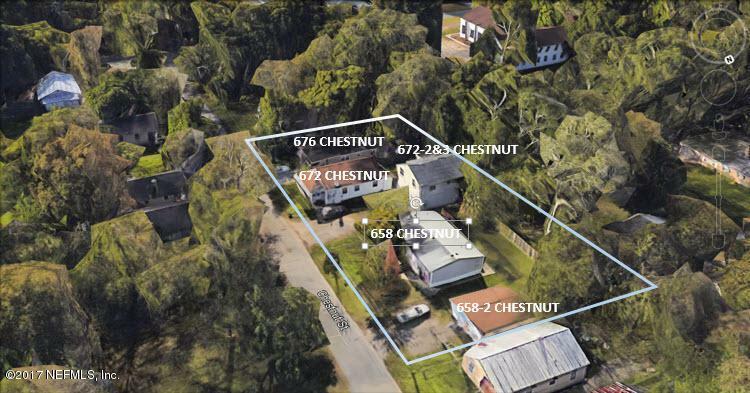 The 5 buildings consist of: 658 Chestnut- 3/2 home. 658-2 Chestnut-1/1 Studio home. 672 Chestnut-3/2 home. 672-2&3 Chestnut- 2-story Duplex. 676 Chestnut-3/2 home. New roofs installed on 3 of the buildings in 2017. Neighborhood desirability has fueled a wave of new construction- 66 new homes in the past 10yrs. Quiet, convenient, and comfortable living. SELLER WILL HOLD FINANCING W/ 40% DOWN. WILL ALSO CONSIDER SELLING PART(S) OF THE PORTFOLIO.